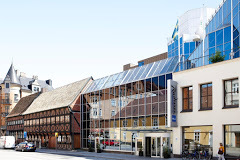 The first COASTAL Biogas conference takes place on the 8th of May 2019 at Radisson BLU, Malmö, Sweden. On the 9th of May there is a study tour to Jordberga biogas facility. The conference and the study tour are free of charge and limited to 50 participants. To register please send your name, affiliation, if you have any special food request (e.g. lactose intolerant) and if you intend to participate in the study tour to jorgen.held@beic.nu. The registration is completed when you receive confirmation. Please note that we are not able to provide visa invitation letters for a free seminar. 10:00-14:00 Study tour to Jordberga biogas facility. Buses departure from, and return to, Radisson BLU, Malmö. Note! On the way back the bus stops at Trelleborg Port (approx. at 13:10) to drop of passengers taking the ferry. You just write “Copenhagen Airport” in the From-box and “Malmö C” in the To-box (it works with Malmo C without the dots over the o, as well). Leave the central station, cross the channel and take the second street to the left. Continue a few hundred meters and the entrance to the hotel is on your right side. It’s a 9 minutes walk (~700 m) in total. See the location and directions in Google maps.